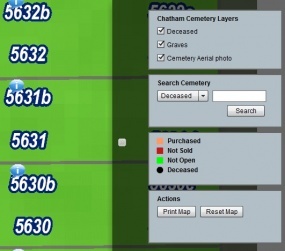 View the interactive cemetary map. Individual burial lots are available in the Chatham Memorial Cemetery on the North side of Walnut Street. Once grave spaces and cornerstones are completely paid for, there will be a deed issued to the owner(s). The Village of Chatham offers the option of making payments on contract with the Village. However, if payments are not received on a monthly basis, the lot will be returned back to the village. Please contact the Village office at (217) 483-2451 to learn which lots are available for purchase.